The metallic pencils have bright, highly reflective pigments designed to stand out. They work best on a dark background and offer a subtle shimmer and dimension to sketches and drawings. They can also be used with other media to add definition and highlights to certain areas of work. The metallic pencils are watersoluble meaning endless amounts of interesting line and wash effects can be created. Add colour to the paper and wash over with a Derwent waterbrush to create intense, bright, reflective colour. Showing 3 of our total 4 reviews, with an average rating of 5 stars. 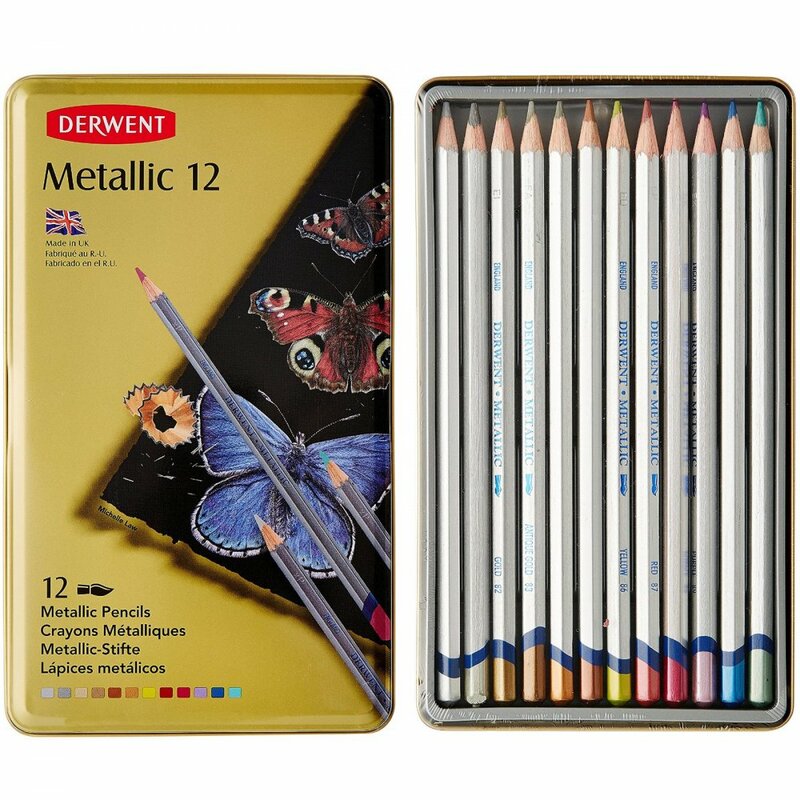 Read all 4 reviews for Derwent Metallic Water-Soluble Colouring Pencils. These metallic watercolour pencils were a beautiful birthday present. I'm pleased with the metallic pencils they give a beautiful, medium, texture and blend well with water. They are soft pencils, light and comfortable to hold in a beautiful range of shades. I mainly work using watercolour paints but have recently started experimenting with pencils and inks. The metallic pencils are great for highlights - especially on water. Easy to use - either wet the pencil or use a wet paintbrush over the drawing for the watercolour effect. Fantastic quality for a great price. Arrived very quickly & well packaged.